Case abandoned by Indian Government..
CaptainSanjeetBhattacharjeeSS-3527/W of 7/8GorkhaRifles, Indian Army together with Lance 5752458ANaikRamBahadurThapawere captured by the Pakistani security forces on the 14thof April 1997 whilst undertaking an operational reconnaissance with the rest of the platoon at the International Border, Bhoj in Gujrat. Witness and intelligence evidence indicates that on the 28thof April 1997 that two Indian Officers were taken to aninterrogationCentre based on the outskirts of Hyderabad/Karachi by MajorKhiyaniand CaptainUmar. The Indian Government formally contacted the Government of Pakistan in relation to the capture of Captain Sanjeet Bhattacharjee and Lance Naik Ram Bahadur Thapa. The Pakistani authorities failed to acknowledge the correspondence from the Indian Government in relation to these two and other Indian missing Officers. 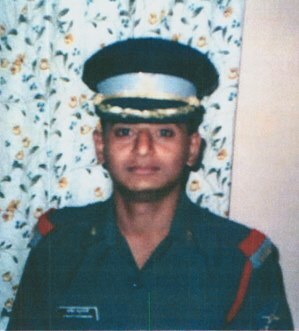 After just over five years after Captain Sanjeet Bhattacharjee and Lance Naik Ram Bahadur Thapa’s disappearance, and after minimal effort by the Indian Government to ascertain their whereabouts, the Indian Government declared both Captain Sanjeet Bhattacharjee and Lance Naik Ram Bahadur Thapa “dead” and proceeded to close their respective files. The failure by the successive Indian Governments to confront the Pakistani authorities and forcing them to account is is of course a gross dereliction of duty which allows the Pakistani authorities to continue to breach international laws and human rights without impunity. The Indian Government should have formally referred these cases to the UN and to the International Court of Justice. We have referred these cases to the UN, Amnesty International, Human Rights Watch. These organisations have acknowledged receipt however, the State should be taking action.